PICT0013, a photo by briancckbrn on Flickr. Walking through the aqua blue tunnel festooned with underwater scenes to the dive shop, I am a bit nervous because I’m on antibiotics and Prednisone for what might be an ear infection (turns out not to be, but still, the last thing you want is not to be able to descend at least twenty feet to finish certification!!!). We meet our instructor. He shows us the tanks and we begin to put on the regulators—wait the BC’s go on first. Are we that tired? We walk the few feet to the training area and Dive Paradise dock. To be honest, I don’t remember what our instructor just said, but just hope I figure it out in the water. We step in and…you know the feeling…Aaah…Its all good!!! We talk a little above and down we go. It’s glorious! Water pours into my mask through my smile lines. I can’t stop it. O well, I can clear. I can do that! I look at Jill and she is wide-eyed and loving every minute—she’s really beautiful when she’s happy. After training (which included plenty of just swimming around)—Yea, my ears were no problem—we went to unpack and relax. We have been up for seventeen hours and are a little punchy. We walk to the courtyard pool area and…its beautiful. I didn’t have time to look at it on our way in—clean, well-maintained, uncrowded, and the piece de resistance a naked gold woman taking a shower (can’t beat that for decor). We sit down and a waiter asks if we want a drink. Now, I am a simple fella. Having someone come up to me while I lounge around the pool and ask if I want a drink is…well..rich. We have one and then another—this is the Caribbean, right, sand and water and rum AND ITS ALL INCLUDED. One night and two more training dives later and WE ARE CERTIFIED. We have a temp card and all the papers to mail. We get an afternoon boat dive as a graduation present. So we show up at 2:45 and board the boat along with about 12 other divers. Most have lots of dives under their weightbelt. We are the newbies to the big ocean. The boat votes for Villablanca Wall . They ask me and all I can say is “How deep is it?” The Divemaster is giving instructions, people are putting on gear. It feels all new. Is this my mask? Did I hook up my BC hose? Did I turn on my air? LESSON 2: ON A BOAT DIVE PUT ON FINS BEFORE BC. Trying to get fins on in a dive boat bouncing off strangers after being loaded down with tank and 18 pounds of weights…bad idea. Fins first! It was a beautiful dive. A wall dive of supreme beauty, Villablanca gives you the opportunity to observe the life above the wall while looking into the abyss below and the coral directly in front. It was an amazing first dive. A couple who are veteran divers from Maine saw us taking pictures and graciously offered to take a couple with us both in it. Back on the boat they and the divemaster asked where we were trained because we sure didn’t look like new divers. Come to think of it so did our instructor for our training dives. LESSON 3: CATHY AND PAUL ARE OBVIOUSLY GREAT DIVE INSTRUCTORS. I won’t describe in detail the other dives. You can find all kinds of info and pictures of all the dives in Coz on the Internet. I will just list what we did. Tuesday: Palancar Gardens (our max. depth 96), Punta Tunich (our max. depth 64), and Cozumel Hotel Shore (our first solo diving). Wednesday: Columbia Deep (our max depth 101), Delilah (our max depth 61). Columbia Deep was probably our favorite. At one point we went through a twenty foot twisty tunnel and emerge right over a huge drop into the dark blue—stunning!!! Delilah also deserves some mention, not because of the reef (beautiful too), but because of our constant struggle. I use more air than Jill so while diving Delilah, I used her octo for about five minutes to try and even out our air use. 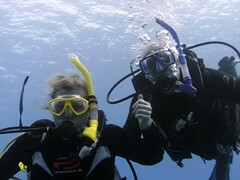 I am sure the Divemaster had a bit of an adrenaline rush when he looked over and saw us. But, I signaled “ok” and on we went. LESSON 4: JILL IS GOOD AT CREATING NEW DIVING HAND SIGNS. There are two in particular that she used. They both are used on land but clearly mean something else underwater. One is to make a fist with your hand and stick up one of the middle fingers. The other is to make an “L” with one hand and put in on your forehead. Despite what they mean on land, underwater they mean “You effin’ airhog. I hate you. I still have at least 1000 psi and you’re making me come up. I want a new dive buddy.” That’s saying a lot for one quick sign. After our Wednesday diving, we just kicked back and enjoyed the resort because we had to fly out on Thursday. During our layover at DFW, we get a text from our oldest daughter. My father is in the ICU. My sister doesn’t think he will make it, he is bleeding from burst veins in his esophagus and they can’t stop it and surgery is too risky. LESSON 5: DON’T WAIT. Life is fragile and sometimes shorter than we want. We don’t know. While we were gone the kids were ok. We have been lucky with college expenses so far and we’ll make it work in future. Buying our own gear gives us a sense of security no matter the cost. To go when we did, to spend the money we spent…I wouldn’t trade it for the world. Tomorrow, something might happen and Jill or I might be unable to travel ever again. Who knows? But whatever happens in the future, we have memories that are irreplaceable. Yesterday, my father called. He has been moved into a regular room. Jill and I are planning our next trip.